The payment practices of gypsy fortune-telling vary depending on the person's fee scale; if you seek out free Gypsy fortune-telling, realzie it is difficult to come by, if not impossible. For one thing, the whole art of Gypsy fortune-telling is tied into a clever business practice. 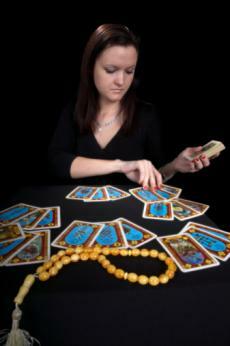 Most individuals market their talents for a living, and psychics are no different in this case. However, Gypsy fortune-telling has acquired a reputation over the centuries due to the history of scams associated with it. In some cases, such scams can be financially devastating to patrons. So, it is important for any individual pursuing free Gypsy fortune-telling, or any sort of fortune-telling, to have an established relationship with his psychic that transcends the mere business aspect of the service. Although the art of Gypsy fortune-telling has been around for a very long time, a true Gypsy fortune teller is simply an individual (usually of Hungarian or some Eastern European heritage) with actual psychic abilities. These psychic abilities may be directed toward one particular art of fortune-telling such as Tarot cards, runes or palm readings; but without the inherent psychic prowess, a fortune teller is merely a con artist. The psychic ability of a Gypsy works independently of his or her race and culture, and so a Gypsy psychic is no more impressive than her non-Gypsy counterparts. Since the archetype of Gypsy fortune tellers has been around for so many centuries, many people attribute a sort of mysticism to this particular branch of psychics. Thus, it is important to note that Gypsy fortune-telling is just one medium of fortune-telling and does not possess any superiority over alternative psychic means. Moreover, fortune-telling is extremely difficult to regulate and subject to legitimate business practices. You can find a Gypsy fortune teller at certain fairs or carnivals; although some actually possess storefronts. Also, as mentioned previously, a free Gypsy fortune-telling is rare, and oftentimes, a reading that is initially promised to be "free" will require funding in the end. Typical fortune-telling practices begin with a minimum fee or payment. As the fortune teller continues through the reading, it is more common for additional fees to emerge in exchange for further information. As more information comes in, more fees will be added on. Of course, the famous "blessed candle" scam is amongst the more notorious practices. Gypsies may discover a "curse" or an area that requires a special candle to be burned for several days. These candles and curse removals can costs upwards of one-hundred dollars, and so many individuals find that their free fortune-telling has incurred a slew of supplementary costs. The need for vigilance and discretion when choosing a psychic should not necessarily deter an individual from seeking out a legitimate psychic. Legitimate psychic abilities cannot be proven by science, but many people's lives have been enhanced by the guidance they received from "gifted" individuals. Thus, the psychic abilities of a legitimate Gypsy fortune teller should not be discounted. People who seek out a fortune teller should simply be careful to ensure that their reading does not follow the common scam pattern. Moreover, they should be skilled enough in the history of fortune-telling scams to be aware of a "psychic's" ability to use broad generalizations and a memorization of body language in order to "read" his or her clients. A legitimate psychic will not rely on information that could be true of any individual in order to rein her clients in and apply further charges. Unfortunately, fortune-telling has been so linked to the prior methods that this occupation has lost almost all credibility. The easiest way to find a free taste of fortune-telling is to approach a Gypsy psychic and ask for a free sample of the individual's ability. A Gypsy who is confident in his or her abilities may just comply, but don't be surprised if a minimum fee is required because fortune tellers are not a sideshow: they are tradespersons who deserve to be paid.